Providing you the best range of two stage evaporative cooling system and two stage evaporative cooling system-hybrid with effective & timely delivery. 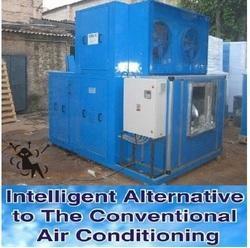 For the total customer satisfaction, we are into providing a wide array of Air Conditioning Systems. These are manufactured by using two stage direct-indirect machine hybrid, 3 stage model and also using DX coils adiabatic efficiency up to 115%. Also, these Air Conditioning Systems are available in single skin and Double skin construction with capacity up to 100000 CMH or in multiplies. Using the combination of DC (Direct Cooling), IDC (In Direct Cooling) and a compressor cooled or chilled water coil to replace Refrigerated Cooling systems. 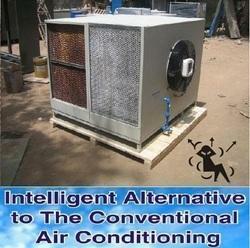 We are also offering Green Air Conditioning Systems. High efficiency directly driven PLUG TYPE BLOWER “BLOW THROUGH” design to have low Db level. 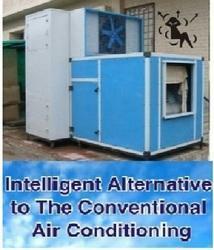 Looking for TWO STAGE EVAPORATIVE COOLING SYSTEMS ?